Although the subject and location of this painting refer to the everyday, British painter Rackstraw Downes gives the scene an almost mystical quality. The wall, the triangular cableway structure above it, and the simultaneous arc of fuel smoke from a passing jet are locked together in time, representing a moment that the artist has recreated in oil paint through a meticulous and time-consuming process. Downes does not use a camera to prepare for his photorealistic scenes, but sketches the location repeatedly at specific times of day over an extended period of time. Instead of following traditional perspective, the lines of Downes' paintings curve slightly, reproducing the way a scene is pieced together by the human eye rather than by a camera lens. For Downes, this assembly of visual information is crucial: "I'm interested in the idea of completeness, of wholeness, of inclusion." While Downes bases his imagery directly in the natural and man-made world that surrounds him, his work consciously takes Realism to task, bending and manipulating it and remaining in dialogue with the work of artists whose enterprise, at first glance, seems far removed from his own. Charles Wylie, DMA Label copy, 2005. 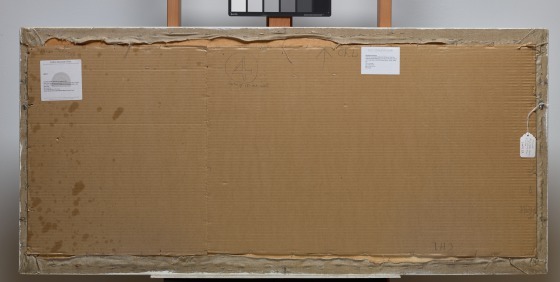 Rackstraw Downes has had two solo exhibitions at the Chinati Foundation in Marfa, Texas, including one of the series to which this painting belongs. Downes spends part of his time in Presidio, Texas, and is intimately connected with the land where this work is painted.